I crossed the bridge. Things slow down, as they do when you move from the developed to the developing world. Secondhand clothes for sale hang on simple brightly painted homes, the poorest made of pallets and corrugated iron roofs. Júarez, home to many of the foreign-owned assembly plants known as “maquiladoras,” has a violent history and big social problems, but in the dusty streets and cafes serving steaming bowls of tripe-and-bean soup I discerned no tension. 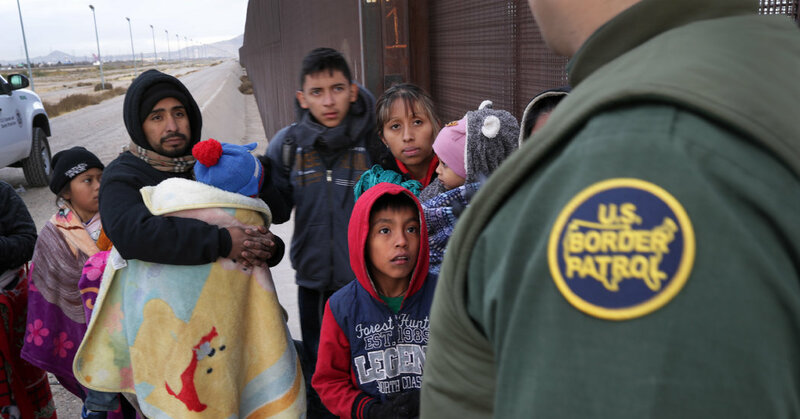 From that mouth seeps the sinister specter of an “invasion.” Thousands of active-duty troops are dispatched to the border. Concertina wire spreads. The government shutdown that ended on Jan. 25 could be followed soon by Trump’s declaration of a national emergency to build his wall. Presidential powers include the power to manufacture a threat where none exists. Bridges, in other words, trump walls. At one of the shelters run by the nonprofit Annunciation House, I met Iris Galindo Maldonado, an undocumented 43-year-old woman from Guerrero State, in southwestern Mexico, who entered the United States on Jan. 15 with her 10-year-old daughter to request asylum. Her husband was killed seven years ago by drug dealers angered by his refusal to cooperate with them. She said they have threatened her in turn for refusing to help them smuggle cocaine. Galindo, aged 43, has been processed by ICE, fitted with an ankle bracelet, and let go to face a long wait in American limbo, along with several hundred thousand others, before her day in immigration court. She has no family in the United States. Annunciation House took her in. Ruben Garcia, the director of the organization, says he is finding beds these days for more than 2,000 people a week. If nothing else, Trump’s rhetoric and policy swerves have helped feed chaos. Representative Veronica Escobar, the successor to Beto O’Rourke, now a possible Democratic presidential candidate, took me down to the spot, near a stretch of existing wall, where border agents detained an 8-year-old Guatemalan boy, Felipe Gómez Alonzo, in December. He later died in United States custody. The spot is over the Rio Grande, in the United States, but just short of the wall, raising the question of the barrier’s usefulness. That is a question the president has refused to address with any seriousness. His wall is much less about security than macho symbolism — “a monument to bigotry,” in Escobar’s words. Bodies, I noted, is a term generally used for dead people. Would it not be better to call them people or human beings, as this is what they are? The agent said he didn’t mean that they are dead, but that “bodies” was the favored term. I was subsequently advised not to read too much into this “law enforcement vernacular.” Border agents are under a lot of pressure. Their gestures of humanity — a birthday cake, a soccer ball — tend to go unrecorded. Still, if you talk about bodies you are liable to see bodies: that is to say, people stripped of their humanity, their agonizing choices, their humble ambitions and their hopes. It is then easier to treat them with callous harshness, to forget what we Americans are and where we came from. When I walked back across the bridge, a United States passport control officer pored over my passport for several minutes: the Iranian visa, the Iraqi visa, the Chinese visa, the Indian visa. She asked what I do, whether I’d crossed the bridge before, why I’d entered Mexico. She was hostile. He looked me over. “Let him go,” he said. I thanked her for the warm welcome home. “Just doing my job,” she said. Trump’s rhetoric is not innocuous.